As marijuana sales in Colorado exceed $1 billion, residents are seeing marijuana tax revenues being put to work in their communities. From funding local projects to restore historic sites and construct a new irrigation system in Denver, to providing college scholarships to more than 500 students in Pueblo, and statewide grants for early literacy programs, Coloradans from every corner of the state are benefiting from the legalization of marijuana. But there’s more. Similar to other areas of Colorado’s public education system that have benefited from marijuana tax revenues, the state’s School Bullying Prevention and Education Grant Program (BPEG), which has earned local and national recognition for its effectiveness, is being funded by the Marijuana Tax Cash Fund. “I think we provide an environment where you can concentrate on studying rather than just on conflicts,” Jessica Hale, Dean of Discipline at Skinner Middle School, stated in a recent interview with the Denver Post. While some remain skeptical of marijuana legalization, it’s hard to ignore the positive impacts it’s having on communities across Colorado. Marijuana use by adolescents continues to decline in California, according to statewide data provided by the California Healthy Kids Survey, a biennial survey funded by the Departments of Health and Education. Among 7th graders, 4.2 percent reported ever having used cannabis during the years 2015 to 2017, as compared to 7.9 percent during the years 2013 to 2015 (-47 percent). Among 9thgraders, 17.4 percent reported ever having used cannabis during the years 2015 to 2017, as compared to 23.1 percent during the years 2013 to 2015 (-25 percent). Among 11th graders, 31.9 percent reported ever having used cannabis during the years 2015 to 2017, as compared to 37.9 percent during the years 2013 to 2015 (-16 percent). The percentage of teens reporting using cannabis multiple times and/or repeatedly within the past 30 days also declined for all age groups. California law legalized the adult use, possession, and cultivation of marijuana by adults in November of 2016. 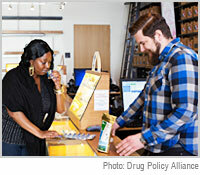 Retail adult use marijuana sales did not go into effect until January 1, 2018. The findings are consistent with those of other studies and surveys from other states finding that the enactment of adult marijuana use laws is not associated with upticks in young people’s use of marijuana or access to the substance. Full text of the study, “School Climate, Substance Use, and Well-being Among California Students: 2015-2017,” appears online here. We have much to be thankful for this year. Lawmakers in 26 states have passed legislation to advance cannabis reform, including New Hampshire becoming the 22nd state to decriminalize marijuana and West Virginia becoming the 30th state to pass a medical marijuana program. This progress has come as a result of years of organizing and conversations with our fellow citizens about the role of government in relationship to a plant. Having the tough conversations about the scope of the government’s right to stop, search, and incarcerate individuals for possessing or consuming marijuana for either personal or medical benefits. And now for the first time ever, Gallup polling recorded outright majorities of Democrats, Republicans, and Independents supporting the legalization of marijuana. The only way to find out if this includes your aunts, uncles, cousins, and other relatives is if you bring it up. So use us as a resource – NORML.org has Factsheets, Talking Points, and you can even pass your phone or computer around the table to have your friends and family contact their lawmakers right then and there to support reform in our Action Center. As we look toward an uncertain future, we know we must work to both sustain our existing gains and to win future victories. With your continued financial support, we are confident that we can bring the era of marijuana prohibition to an end and usher in the new era of legalization. Together, we will be unstoppable. Together, we WILL legalize marijuana across this great country. From all of us at NORML to all of you, we hope you have a hempy and happy Thanksgiving. What’s a medical marijuana card-holding college student to do when they are required to live in on-campus housing but their medicine is banned from the premises? Apparently, choose between suffering from their illness or face disciplinary action, at least according to the majority of University policy. In Washington DC, marijuana is legal to for those over the age of 21 to possess, transfer (exchange with no currency involved), and grow up to two ounces of marijuana in their homes and available to buy from a dispensary for medical use per a doctor’s recommendation. However, given its treatment on college campuses in the area, you would have no idea. To use or possess any illegal drug (including medical marijuana) or drug paraphernalia in the residence halls. To sell, manufacture, or distribute any illegal drug (including medical marijuana) or drug paraphernalia in the residence halls. To knowingly and voluntarily be in the presence of any illegal drug (including medical marijuana) or drug paraphernalia in the residence halls. At The George Washington University, their policy on medical marijuana is less clear. Their policy for medical marijuana is not listed in their Code for Student Conduct, and when asked for clarification on the matter, the administration declined to respond. The code for student conduct does say, however, that students caught using, possessing, and distributing marijuana face a minimum $50 fine, mandatory drug education classes, and possible eviction from housing. If there’s an intent to distribute, students face suspension or expulsion. Alcohol penalties at the school, on the other hand, are significantly less harsh. The penalty for consumption and possession is parental notification, and in subsequent offenses, students could face a possible fine or alcohol education classes. In addition to this, GW provides an Alcohol Medical Amnesty Policy, wherein underage, intoxicated students can receive a penalty-free ride to the hospital in a student-run ambulance for their first offense. Subsequent offenses receive harsher penalties each time, though it takes much longer for a student to reach serious disciplinary action than for marijuana users, who are harshly penalized for their first time. So why do these schools remain so behind the times? Why is marijuana classified so much more harshly than alcohol– which kills over 1800 students per year and is heavily associated with sexual assault? The answer comes down to the same reason a college makes any decision: funding. According to the Drug-Free Schools and Communities Act of 1989 (that’s right, 1989), the use of “drugs” (a vague term that somehow excludes alcohol and caffeine) must be disallowed by schools, universities, and colleges. If they fail to comply, they become ineligible for federal funding. Until we can overcome the pervasive stereotype of cannabis users as sluggish, lazy, stupid, and unconcerned, it looks like students will have to continue to live in the impossible bind between relieving their illnesses and violating school policy.